Heavy snow and freezing temperatures in Europe forced Air Canada to cancel or delay several flights to London on Saturday after the closure of Heathrow Airport. The airline said it diverted three London-bound flights to Paris and had to cancel most of its London-bound operations Saturday evening. A dozen Air Canada and British Airways flights between London and Toronto were delayed or cancelled Saturday because of the weather. A half-dozen flights between Vancouver and London were affected, as were a couple from Montreal to London. Air Canada warned that "further delays and cancellations are expected." The airline asked passengers to postpone non-essential travel and said it was waiving change and cancellation fees for those who wish to reschedule on affected routes. "Air Canada is doing everything it can to ensure that customers arrive safely at their destination and that those whose travel has been disrupted are taken care of," Duncan Dee, Air Canada's chief operating officer, said in a release. Air Canada is advising customers to check the status of their flights by logging on to the Air Canada website at aircanada.com or calling Air Canada's automated flight information system at 1-888-422-7533. Travellers were warned to expect travel disruptions all day Saturday across Europe because of heavy snow and cold. London's Heathrow and Gatwick airports closed because of snow and ice, and British Airways suspended all domestic and European flights. "We're talking about as little as three inches [seven centimetres] falling in an hour at Gatwick Airport. It doesn't sound like a lot to Canadians. But at Gatwick, it was enough to shut it down," said freelance reporter Larry Miller. "British Airways cancelled all flights. They hope later to start up again, but that remains to be seen. So a lot of flights were cancelled at Heathrow and there were a lot of people stranded. "Last night, there were a number of passengers on the runway ready to take off and, ultimately, they were sent back to the terminal without their luggage and told to fend for themselves," Miller told CBC News. Shaan Pawa, a Canadian student trying to get to Vancouver, said he sat in a British Airways plane for three hours Friday night before being allowed to return to the terminal. Once there, he was told his luggage was lost and the next available flight would depart Dec. 25. "They had been telling us they were just waiting to de-ice the plane and that we would be taking off shortly," Pawa said, adding that once everyone disembarked, "Heathrow was an absolute zoo." "There was complete mayhem. Nobody knew what was going on. It was so crowded, you couldn't even move. There were not enough staff available to talk to," he said. "They actually had to get policemen to hold people in line, just to stop people from basically trampling each other." At Gatwick, dozens of snowplows were deployed Friday in an effort to clear the airport's runway before operations were shut down. Simon Calder, a travel writer for the Independent newspaper, said Heathrow usually handles more international travellers than any other airport in the world. 'That means just from [British Airways] alone, we are certainly going to see 20,000 or so people booked on long-haul flights who won't be travelling out of London. And everywhere from Nairobi to Entebbe to Cape Town to Los Angeles, people who are stranded, trying to get back to Britain, won't be travelling either," he said. The airline said it expected flights would remain grounded for much of the day. Hundreds of flights have been cancelled at airports in Switzerland, Germany, Denmark, France and the Netherlands. In Poland, cold weather is hampering train service. 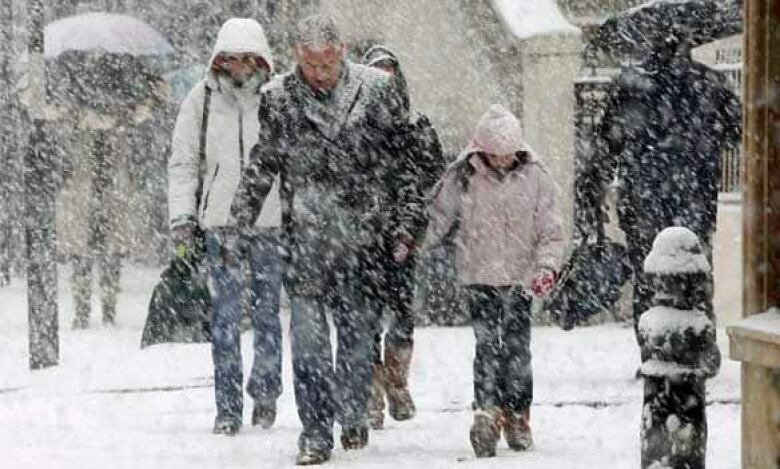 To the south, in Bulgaria, nearly a metre of snow was reported Friday. The main highway and airport in Varna was closed for several hours.